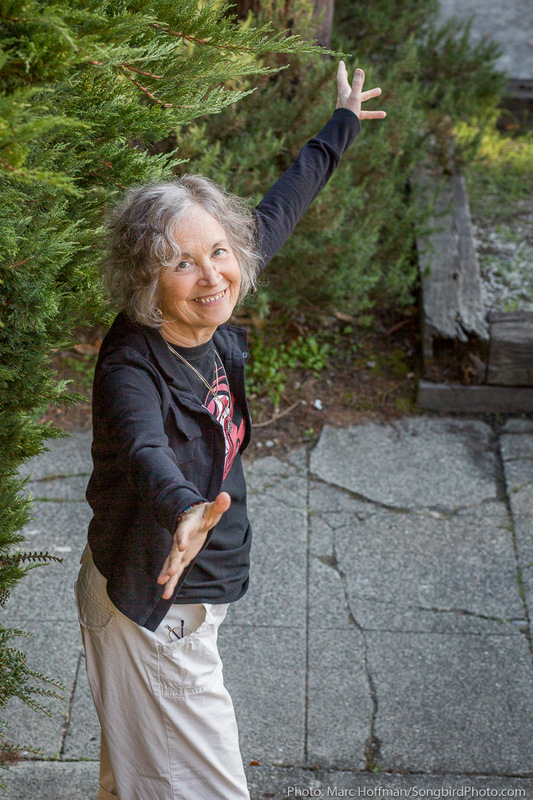 Linda Waterfall at her Seattle home, 2015. We are sad to announce that Linda Waterfall passed away in Seattle, Washington, on January 8, 2019, following a long illness. Linda left this world encircled by the love of people close to her. She was 69 years old. Linda’s death is an enormous loss that will reverberate throughout the wide community of musicians, artists, fans, friends, and family who knew and loved her. But it is well to remember the vitality and vibrancy Linda brought to her very full life and the lives of so many others—through her music, art, teaching, compassion, generosity, and keen intelligence. Linda grew up in a musical family where she received early training in classical piano, music theory, composition, and voice. She graduated Phi Beta Kappa from Stanford University, with a B.A. in visual art. Her music reflected her classical training as well as a wide range of influences, including folk, jazz, blues, rock, and world music. Her ability to apply her personal genius to these styles resulted in a sound that was unique, beautiful, and celebrated. Over the course of her career, Linda was repeatedly named Seattle’s top singer-songwriter. Her 2015 album, Hometown Girl, was chosen by Seattle Times music critic Paul de Barros as one of his ten favorite albums of the year (read Paul’s Seattle Times postmortem for Linda). And in 2016, readers of Seattle Magazine voted Linda one of Seattle’s 20 most-talented people. Other equally strong and colorful threads wove their way through Linda’s life. She was a deeply spiritual person who practiced her beliefs with dedication and a sense of wonder. She was a generous teacher who eagerly shared her knowledge and love of music with her students. She was a loyal and open-hearted friend who cultivated a host of life-long friendships across wide spans of time and distance. Linda was also a joyful and devoted spouse to Bob Searle, whom she married in 1996, and who preceded her in death in 2016. Linda and Bob shared a deep and affectionate bond that was plain for all to see. Although they lived in Seattle, it was at their small, river-side cabin in Forks, Washington, that they forged their fondest adventures and memories. Linda loved to tell how, on summer evenings, they would sit together smoking cigars and sipping whiskey on the cabin porch. The gifts Linda embodied and shared are a legacy that, through her example and music, will continue to enrich all those who knew her and will continue to know her. Quileute Tribe Drum Group. The drum group is held every Wednesday evening in Forks, for local people in recovery. Linda and Bob always participated when they were at the cabin. The mailing address is Quileute Tribe, PO Box 279, La Push WA 98350. Checks can be made out to the Quileute Tribe Drum Group. Puget Sound Guitar Workshop Scholarship Fund. Linda taught for many years at this local music camp (www.pugetsoundguitarworkshop.org/scholarships). Seattle New Beginnings, a Seattle-area shelter and services for abused women and children (www.newbegin.org). Forks Abuse Program. Forks-area shelter and services for victims of domestic violence (www.forksabuseprogram.org). Friends of the Earth. Political organizing for a more healthy and just world. Speaks truth to power and exposes those who endanger the health of people and the planet (https://foe.org). Idle No More. Join in a peaceful revolution to honor indigenous sovereignty and protect the land and water (www.idlenomore.ca). Please note: We will not be processing mail orders for Linda’s music while her affairs are being put in order.